CT fastrak buses at the Main Street station in New Britain. Gov. Dannel P. Malloy renewed his push to bolster Connecticut’s transportation program in 2018, urging legislators Wednesday to resist the traditional election-year approach of dodging controversial topics. Legislators “refused to discuss it (transportation) in non-election years. 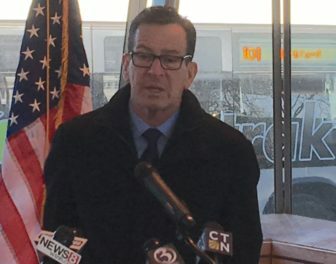 Give me a break,” Malloy told reporters while outlining new transportation projects at the CT fastrak station on Main Street in New Britain. The governor, who must recommend adjustments to the 2018-19 state budget when the next regular General Assembly session starts on Feb. 7, has not disclosed any specifics to date. But Malloy clearly has laid down the challenge for a robust transportation debate in his final year in office. He is not seeking re-election to a third term. The governor warned Wall Street last month that the new state budget short-changes the transportation program, which is headed for dramatic contraction over the next five years. Connecticut would need to scrap some rail services, drive up rail and bus fares, reduce infrastructure maintenance, suspend as much as 40 percent of planned capital projects and defer major highway rebuilds like the Hartford viaduct. Some of these cutbacks would have to begin as early as 2018, absent more funding. After his presentation to Wall street credit-rating agencies, Malloy made his pitch for a 2018 transportation debate through a series of December speaking engagements before business leaders and a new panel studying state budget challenges. Legislative leaders responded, for the most part, in general terms earlier this month about the need to strengthen the Special Transportation Fund at some point. House Speaker Joe Aresimowicz, D-Berlin, went one step further calling for a debate now. 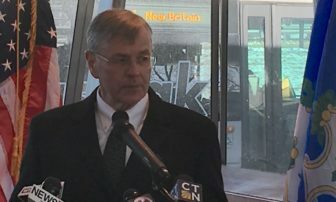 Transportation Commissioner James Redeker said Connecticut needs to think about the future of its economy. The legislature has endorsed a new legal “lockbox” provision to try to ensure revenues dedicated for transportation cannot be redirected for other purposes. A proposal to add this as an amendment to the state Constitution will go before voters on the ballot this November. But the governor, who supports the “lockbox,” said lawmakers also have had options for bolstering transportation funding laid out for nearly two years now. Malloy was referring to his Transportation Finance Panel. A study group of transportation advocates, the panel issued a January 2016 report that laid out options to raise an estimated $42 billion collectively over 30 years. These include various scenarios for establishing electronic tolls on highways, increasing gasoline taxes and boosting sales taxes.